Remember when Ralph Macchio had to face off against the Devil in a Guitar Showdown? The Rockstar who played the devil in that cult movie was Steve Vai, and he also played Macchio's guitar solo. Now you too can play your favorite rock song...in a manner of speaking, better than air guitar too..with Guitar Hero, the video game for guitar rock fans. First, Dance Dance Revolution, which made rhythm based music video games extremely popular. For dance music fans that is. Then in 2005, Konami came out with Guitar Hero, a rhythm game that uses a guitar as your controller and you match finger placements pressing on buttons on the neck and body simulating the way a real guitar player would play his instrument. video cabinet set in 2008 from Konami. As a game for beginners who love rock music, the game became a blockbuster hit especially when the Xbox came around and supported the game. 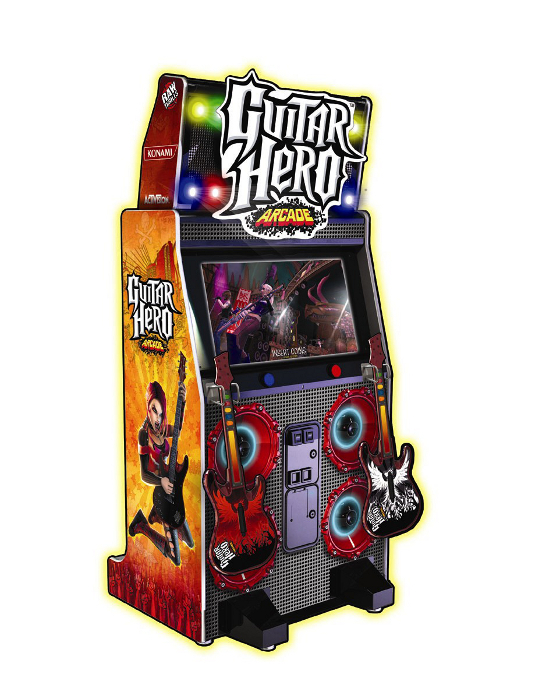 An arcade cabinet version of Guitar Hero even came out in 2008 from Konami to promote the game to fans in video arcades in malls. Even with full ensemble games like Rock Band, Guitar Hero is still the preferred rhythm game among guitar rock fans. Gameplay is Better than Air Guitar! became a worldwide hit because of being in the playlist of Guitar Hero. Guitar Hero is played with a special guitar-shaped controller with five color coded buttons on the neck, one on each of the first five frets. The game screen scrolls a scrolling fret board with running notes which you time your button press while strumming the flipper like a true guitar god. As the song goes on, notes line up and you should hold down a certain button for a longer period of time. The game starts with easy 3-chord songs to play then pushes on to the more difficult metal songs. You ramp up to the the faster and more complicated guitar songs from playing the slower rock songs and enjoy the game like any air guitar whacko. The game is easy to learn even for rhythm video game beginning players. The basics of the game are shown in a short demo tutorial, including star power score pumping by tilting your axe like rockdudes do in a concert. Tilting the guitar causes the notes to light up and your score is multiplied sweetly. The game has a playlist selection of classic rock and metal tunes, and is heavily biased in favor of catchy and memorable guitar songs. There are 30 songs in career mode, plus another batch of unlockable tunes from the developer's various bands. For kicks, while playing the game, the video screen displays a themed rock band playing along with you. The themes range from a punk basement party to an arena rock show, and even one show with Viking just like you were playing True Norwegian Black. Guitar Hero is one of those desert island video games that offers a better than air guitar, playing experience, and an amazing playlist selection for the beginner to expert run-through. The game is fun to play solo, or when you can drag your chimp friends to monkey around like Bill and Ted on a weekend night. Grab yourself one and be Steve Vai or Eddie Van Halen for a weekend, every weekend.